School Library Journal School Library Journal | Not Your Nest! 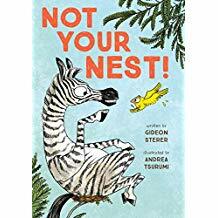 School Library Journal | Not Your Nest! Not Your Nest! illus. by Andrea Tsurumi. 40p. Dial. Mar. 2019. Tr $17.99. ISBN 9780735228276. PreS-Gr 1—A small yellow bird is proud of the beautiful nest she has designed and built all by herself in an acacia tree on the African plain. When she gathers one last element to complete her resting place, she is surprised to find that a large bird has taken up residence. The big bird won't budge, so the small one goes off to design and build another nest only to discover this one usurped by a fox. Every time the little bird builds a nest, another animal claims it. Soon a gorilla, a giraffe, an elephant, a zebra, and others decide they want to live in a nest high in the treetop. As day turns to night, the exhausted bird has had enough. The creatures come to a compromise in a conclusion that will satisfy a young audience. The first page serves as foreshadowing as all the former ground dwellers are carefully watching the original nest being built. Large, clear illustrations add even more humor to this poor bird's preposterous predicament. VERDICT An enormously amusing read-aloud choice.